The history of the Holy Trinity-Holy Cross Greek Orthodox Cathedral of Birmingham, Alabama began in the late 19th Century. The first Greek male immigrant arrived via Mobile, Alabama to Birmingham in 1884. A constant stream of immigrants followed all seeking economic, social, and religious freedom. Their occupations were fruit vendors, steel workers, saloon-keepers, coal miners, and day laborers. Becoming ambitious, many of the immigrants wanted to start their own businesses and naturally gravitated to the food industry where they could open their own restaurants. As Birmingham thrived, the Greek community grew to 100. They began to marry and start families. By 1903, they realized they had to address their religious and spiritual needs. Consequently, they formed the “The Lord Byron Society” to raise money for building a church. In 1906 they purchased a small wooden church building from First United Methodist Church, located on the corner of Third Avenue South and 19th Street South next door to a fire station and near a row of dingy wooden warehouses. Iconographer Constantine Macris designed and built a traditional Byzantine iconostasis for the sanctuary. Father Callinicos Kanellos from Calcutta, India, became the first priest of Holy Trinity Greek Orthodox Church. When World War I broke out, many of the immigrants went to fight for America. After the war, business resumed and from 1921- to 1930 the Greek community grew and prospered. A new Greek American generation was born in Birmingham who needed an education and community center. In 1934 construction was completed on a Hellenic Community Center built adjacent to the Church. Meanwhile more Greek immigrants on the north side of town became large enough to build an additional Church called Holy Cross. Both churches flourished. Father Demetrios Sakellaridis served as the priest of Holy Cross. During World War II, parishioners from both churches fought with the allies. In 1945, the war was over. Father J.M. Mekouris was priest at Holy Trinity and ministered to many of the veterans who returned home and went to college on the GI Bill. By 1949 the Holy Trinity building was completed in Byzantine style with a seating capacity of 450. The community numbered 300 and consisted of doctors, lawyers, scientists, engineers, writers, teachers, coaches, and athletes. The young people formed GOYA and wanted to unite the two churches, and so in 1953, both churches united to form Holy Trinity-Holy Cross Greek Orthodox Church on the south side of town. Archbishop Athenagoras consecrated the altar in 1956. Father Emanuel Bouyoucas was the priest, followed by Father Sam Gouvellis. During the late 1950`s civil unrest began to fester in the South. Thus the early 1960s was the era of civil protest. The Church in Birmingham was thrust into the national limelight on the onslaught of the Civil Rights Movement. Father Sam Gouvellis, an advocate of Civil Rights, was summoned, by Archbishop Iakovos of the Archdiocese to take part in the Selma March, led by Reverend Martin Luther King. As a result of the march, the church became a target of the Klu Klux Klan and received many death threats. However, the Church stood firm. 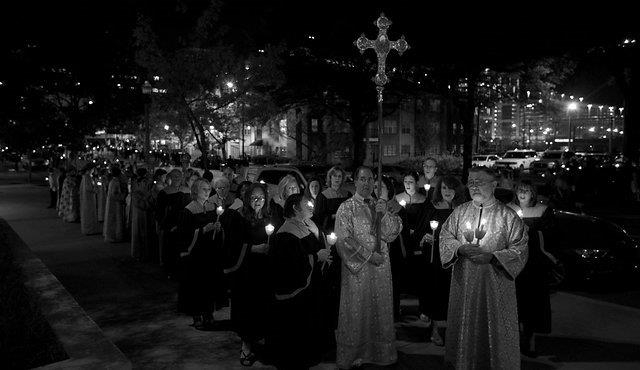 By the late 1960’s Father Constantine Leftheris became priest and the parish was honored and showcased by Birmingham’s Festival of Arts. This event gave birth in the 1970’s to the annual Greek Food Festival now in its 45thyear. It morphed into a cultural event supporting local charities. In 1971, a new 25,000 square foot Educational Center designed by architect Art Garikes, replaced the existing Community Center. Due to the efforts of Father Elias Kalariotes, the church was eventually designated a Cathedral of Alabama by Archbishop Iakovos in 1977. At the untimely death of Father Elias, Father Emanuel Z. Vasilakis became Dean of the Cathedral and guided its growth through the 1980’s by acquiring a new property: the historic Firehouse. In 1993, renovation began. Soon the 40,000 square foot site became a new facility paralleling the Byzantine architecture of the church. Located on the corner of 4th Avenue South and 19th Street, the building was designed by Kenneth Traweek. It housed administrative offices, library, book store, Philoptochos Ladies Auxiliary parlor, atrium, kitchen, a large hall, meeting rooms, classroom, and the St. Nicholas Chapel. The family center was dedicated and named for the late Dean of the Cathedral, Father Vasilakis in l995. As the Cathedral grew so did its ministries to greater Birmingham. The Cathedral Day Care was established where nearby University of Alabama (UAB) workers enrolled their children. A Birmingham Philhellene Society founded a Hellenic Scholars library at a nearby college that teaches ancient Greek and the classics. The homeless were served at the downtown Firehouse Shelter, which the Cathedral greatly supported by providing healthy meals, shelter, and clothing to the less fortunate. Others who faithfully served Holy Trinity-Holy Cross were now Bishop Sebastian Skordallos, the late Father Nick Capilos. At the untimely death of Fr. Emanuel Vasilakis in 1995, assistant priest Father Michael Sitaras became Dean of the Cathedral. In 1996, Father Paul Costopoulos, was appointed Dean of the Cathedral and vicar of Central Conference of the Atlanta Metropolis. By now the parish consisted of three hundred families and became the third largest parish in the Metropolis. Assistant Priests assisting Fr. Paul were Father Soteris Rousakis, Father John Johns, and Father Elias Stevens. Fr. Micah Hirshy arrived in 2011 to lead the youth ministries and assist Fr. Paul. Father Paul encouraged outreach as well as support of the religious education, seniors’ ministry, help for the Salvation Army, 9/11 firefighters, and hurricane relief for Katrina victims. Subsequently Father Paul launched a radio ministry called “Come Receive the Light” which was on the radio for five years. In the years that followed his sermons were taped and distributed for shuts-ins. In the 1990’s, as youth activities increased in athletics, dance, church school, vacation church camp, the Cathedral purchased forty acres of land in Harpersville, Alabama, which served as a Youth Camp and Retreat Center. The land was named Camp Vakakes and there are plans to build a chapel on the site. In 2006, the community celebrated the 100th anniversary of its founding. Birmingham once a town of hungry steel workers had become a nationally recognized medical center. The Cathedral became surrounded by new development. Lofts, shops, supermarkets, and UAB buildings dominated the landscape, prompting the Cathedral to lose parking space. Hence parishioners began thinking of developing some of the church’s vacant property across the street. In 2017 a 12,000 square foot parking lot was completed that accommodated 70 spaces. An additional parking lot behind the church was paved that added 16 parking spaces. Beautification and renovations in the Hellenic Center occur on an on-going basis, as well as restoration of icons and murals in the sanctuary by iconographer Elias Katsaros. The little church that is the third oldest Greek Orthodox parish in the United States became a Cathedral and is one of the most vibrant Greek Orthodox Cathedrals in the country. As downtown Birmingham is rejuvenated, our future holds many opportunities to continue teaching, sharing and living the Orthodox faith.